Every $1 billion invested in the U.S. transportation infrastructure supports and creates some 47,500 jobs. According to the American Public Transportation Association, Americans are using public transportation more today than at any other time since 1956. Public transit provided 10.7 billion individual rides last year, a 1.1 percent increase over 2012 and the latest uptick for an industry that has seen a 37.2 percent increase in ridership since 1995. This is something to crow about. “I can’t help but think of the historic connection between transportation and the civil rights movement. Literally or figuratively, transportation has played a role throughout the history of our nation’s progress toward civil rights. And it still does. “When escaped slaves sought their freedom, they traveled on the Underground Railroad. “In the mid-1950s, a young woman who sat down and refused to get up—she did it on a transit bus. And the boycott of the Montgomery, Alabama, bus system resulted in changes that spread across the South. Public transportation helps combat climate change. A private auto produces 0.96 pounds of carbon dioxide per passenger-mile, while public transit (averaged out among bus, heavy rail, light rail, commuter rail, and van pools) yields 0.45 pounds per passenger-mile. The EPA estimates that public transport saves America 37 million metric tons of carbon dioxide emissions per year—this is equivalent to the emissions resulting from the electricity generated from 4.9 million households, or every household in Washington, D.C., New York City, Atlanta, Denver, and Los Angeles combined. And public transportation saves the U.S. 4.2 billion gallons of gasoline every year, more than triple the amount of gas we refine from oil imported from Kuwait. 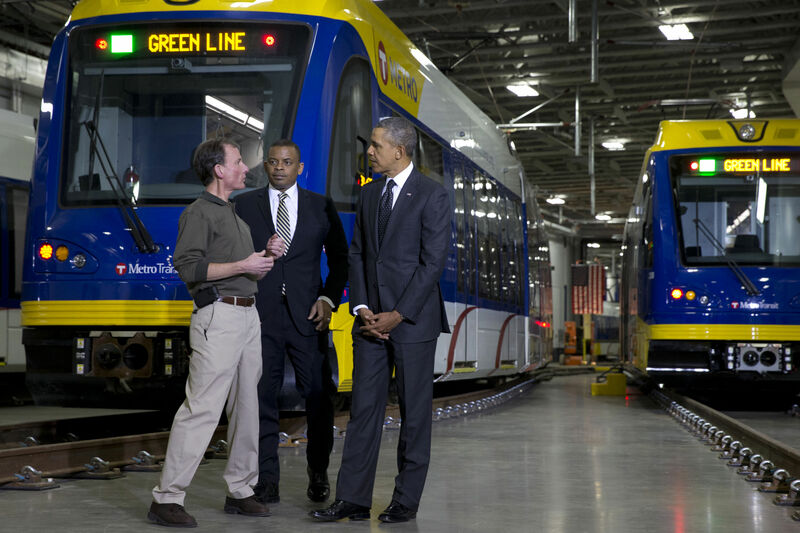 Public transportation creates jobs and promotes economic growth. Every $1 billion invested in the U.S. transportation infrastructure supports and creates some 47,500 jobs. That billion-dollar investment also leads to a net gain in GDP of $3.5 billion. Businesses located near public transportation services see improved productivity through better employee reliability and less absenteeism and turnover. Since public transport allows more people more access to more jobs, employers have larger, more diverse labor pools from which to draw workers, which leads to yet another improvement in community efficiency and prosperity. Public transportation is healthier. Long, traffic-choked commutes are linked to obesity and chronic pain, to divorce and depression. Interestingly, adopting a public-transportation habit also spurs other healthy lifestyle choices, such as increased exercise and improved diet. Yet somehow, despite its proven promises of a cleaner environment, a more robust economy, a healthier populace, etc., support for public transportation remains anything but a no-brainer. Last December, Congress declined to renew the public-transit tax credit, which had allowed Americans to set aside $245, pre-tax, for use on public transit. This year, the credit dropped to just $130—while the tax credit that commuters can set aside to pay for parking actually increased. We can use public transportation to mitigate inequality, to improve the environment, to develop technologically and economically; it puts more of us on the right side of the tracks. Let’s keep this trend going.